Photos courtesy of Tyann Marcink along with numerous family members. 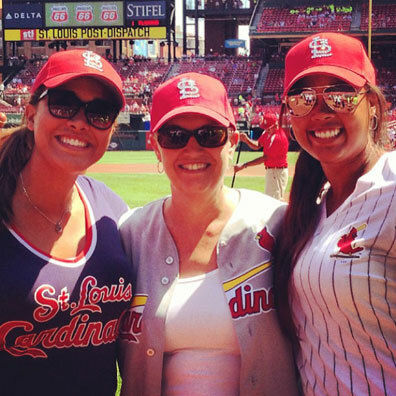 Pictured is Brenda and two daughters, Ashleigh (left) and Kristina (right) after watching their mom throw out the first pitch at Busch Stadium. 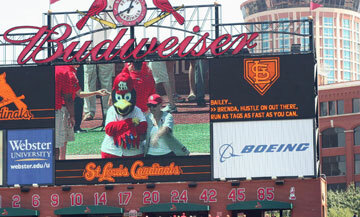 On Sunday August 25th, Brenda Bailey was given the opportunity of a lifetime. 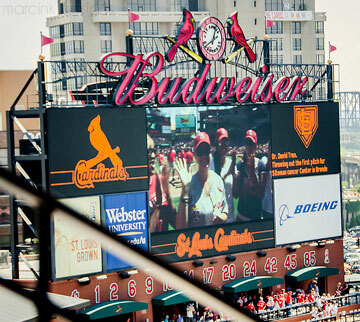 Being a die-hard Cardinals fan, it had always been a dream of hers to step foot on the field at Busch Stadium; but throwing out the first pitch was more than she could ever had hoped for, and more than anything, she felt blessed to be alive. Three months prior, on Friday, May 17, Brenda's life would be forever changed. After having three weeks of severe migraines Brenda had an MRI done which revealed a mass on her brain. Brenda said, "I thought to myself a mass... ok it's probably no big deal." Brenda will tell you she's been blessed to have so many wonderful people in her life but none greater than her two daughters, Ashleigh and Kristina, "her girls". In Ashleigh's letter she begins with saying, Where should I begin when talking about my mother, Brenda Bailey? I am one of her two daughters that are her life. Her and my father divorced when I was in fourth grade and from that moment everyone saw just how tough of a lady she really is. She worked long hours and overtime to make sure that my sister and I had what we needed but never missed a moment in being our mother. She was at every concert, game, and practice for both my sister and I. If there was something that she was going to prove, it was that just because she was a single mom she would not want pity nor treated any differently! Recently, our lives all took a turn for a path that we were not necessarily prepared for. You see my mom had been having, what she thought were migraine headaches for about 3 weeks before this date (May 17)…headaches that felt like a constant brain freeze and would cause her to have to sit down. Not only was she having headaches, but her personality was changing! She wasn't that determined person that was on top of things, she didn't remember to do simple tasks she had always done, it was almost as like someone had taken over my mother...and she wasn't coming back. However, because of her determined spirit and high pain tolerance she continued working as an IT project manager for not one, not two, but three financial institutions. After being told she had brain cancer, my mother sat there as a 50 year old woman wondering where do I begin... Her undying faith in The Lord has carried her through from that moment up until today. There has been so much that has happened in the time from May 17th to now... My mom truly feels like she was given this brain tumor in order to help others and Siteman is the place to be in order to do so. Since we have been at Siteman and after further pathology tests being run, they determined she has a stage 3 Anaplastic Mixed Oligoastrocytoma that is currently being treated with chemo and radiation. During this same time she is participating in an anti-seizure treatment drug, filling her desire to help others through research studies. The news Brenda was about to find out is what she later described as a blessing. 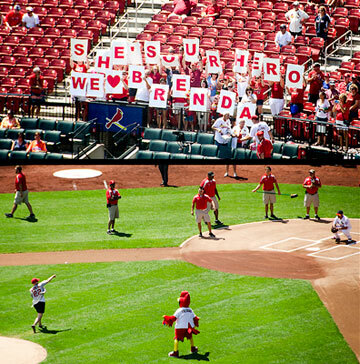 "When I looked up in the stands behind home plate I saw over 50 fellow employees from Bank of Washington and United Bank of Union holding up a sign that said you are our hero we love Brenda. Them being there was such an honor then me finding out I was throwing out the first pitch because you know what you mean to people." In my emotional interview with Brenda, she explained the sequence of events that in the end exemplified the courageous person she is and the faith she has in God. "When the neurosurgeon came into the room and said she had looked at the MRI, I asked if it was cancerous." Without hesitation the neurosurgeon told Brenda, along with her parents who were there with her, that "without a doubt it was brain cancer. I have seen thousands of these and I'm usually not wrong". Then the neurosurgeon said, "I want to do the surgery on Monday." Brenda said, "Oh my gosh on Monday?" Her doctor then proceeded to tell her that "if I don't remove it you may only have 30 days and if I do remove it maybe 12 to 24 months." "I didn't want to look at mom and dad because of course I knew I would lose it so first I regained my composure and thought how am I going to tell my girls" referring to her two daughters, Ashleigh and Kristina. Excerpt from Ashleigh's letter: "I have never and will never be able to give my mom anything close to what she has provided for me throughout my life but if you would please consider her to throw out the first pitch I would be able to say that I have given her something that she has wanted for a long time!" Monday, May 18 before the surgery Brenda found out the mass was the size of a softball. The surgery went well however they were only able to remove 94% of the tumor. After much discussion among doctors they decided to forgo a second surgery and use chemo and radiation to destroy the remaining 6%. At the time she thought it was Stage 3 Glioblastoma. In the end, the surgeon found a blessing in disguise. When she went in to remove the tumor, she reported that pathology test showed a Stage 3 Anaplastic Astrocytoma. Brenda ended up getting a second opinion from Siteman Cancer Center and the final consensuses was a Stage 3 Anaplastic Mixed Oligoastrocytoma, which was treated with 33 radiation treatments and chemo. A courageous and fearless Bailey said, "Then I thought to myself, Brenda get your composure. You have people to take care of and people who still need you; you can't be a basket case." Brenda was never once scared. She said, "I just knew it didn't matter because I couldn't change anything about having brain cancer except give all my faith and trust to God." This is the same person who had just been told she may not live more than a year or two. 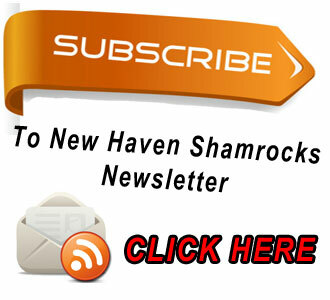 Then again, Brenda is not your ordinary person; she is New Haven's very own super hero. Brenda says that having brain cancer has been a blessing; before all of this happened she had always had a strong faith but was not doing what God intended for her to do. "Before, all I had done was work, work, work and was not doing what He wanted me to do. I faithfully believe Him placing this tumor where it was; was His way of knocking me upside the head and saying, 'Brenda there are a lot more important things for you to do and not stress yourself out with things that are not nearly as important in life.’"
There was a night when "her girls", her sister Janice and her two daughters, were spending the night and after Brenda could not sleep she said, "I guess it was about 3 a.m. when this feeling came over me of complete warmth, over my whole body." "I felt it was God there by me, because I was worried, since there was nothing I could do to change things. What am I going to do? What's my job now?" As these questions continued running through her mind she "felt a sense of Him relaying to me ‘you're a strong person and that's the way I made you and you can get through anything with My help and I'll never put you through more than you can handle’." "I continued laying there and couldn't sleep and thought okay, I need to wake everyone up and tell them this because we need to have this off our minds so we could lay down and have a few good hours of sleep." Excerpt from Ashleigh's letter: Everyone that I see that knows my mom and her battle ask me "how is mom doing" and my answer the majority of the time is "excellent, great, couldn't be better!" I'm sure many people are blown away with that answer but it’s the absolute truth! My mom has purpose again in her life, she's positive about the future, she encounters each battle as they come, she encourages so many people on a daily basis, but if all of these things wouldn’t be present, she simply is showing the world the mom that I have always known she was! Strong, determined, faithful, and beautiful. She’s a woman that isn't going to let news of anything hold her down! She is my life, my inspiration, and everything that I've ever needed to become the women I am today! "I needed to be told this because "my girls" were worried about me and I needed them to know I was not worried anymore. Even to this day I can't ever remember being worried and the first thing my girls will tell you is they're more thankful than anything to have their mom back." Brenda said, "This was a life changing experience. I do feel this whole thing was a blessing beyond anything I could ever comprehend because it has changed my life and has changed so many other people's lives in the way they think about what is important." I asked Brenda if she was given the chance to go back in time and not have brain cancer would she? "No, this needed to happen. It has changed me for my whole life. I know what life for me needs to be about. Before I was living with being so involved with work and things that I felt it was my responsibility to do and I wasn't leaving it up to Him to help me get through those things and thinking I could handle everything myself." "Honestly this was a blessing. I would go through this over and over again if it meant helping other people lead and do Gods work for Him, and be able to share that with other people." At the end of our conversation, my eyes filled with tears and for one of the first times in my life I was speechless. All I could say was, "You are a courageous person." Brenda's response, "I am no different than anyone else... I do these things for Him." Since returning home from surgery, every morning Brenda sends out a "Thought of The Day" to over a 100 people via text message or email, hoping that someone will take that message and change their day. She wants all that read the message to share with as many people as they can. On September, 18 Brenda will have an MRI done to see if the treatments are working. While her fight is far from over she "faithfully believes when I go back and am done with all the chemo and maybe in this next MRI there will be nothing there and I can't wait to see what the MRI shows." If you would like to receive Brenda's inspiring "Thought of The Day" Click here to sign up.